Companies whose managing director, or whole-time director, has crossed the age of 70 will need shareholders' approval for reappointment. The Bombay High Court recently ruled that a managing director and whole-time director who crossed 70 will be automatically disqualified' and companies will have to call a general meeting of shareholders to pass a special resolution enabling them to stay on. More than 120 listed companies will have to approach minority investors in this regard, according to an ET study. 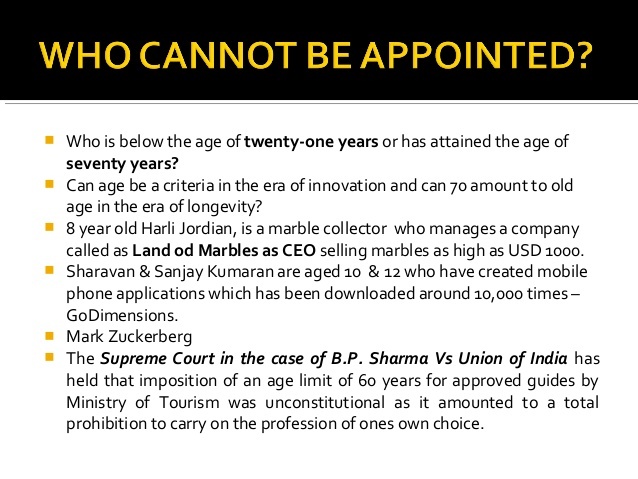 “The Companies Act 2013 was very clear that a MD/WTD cannot be appointed or continues after appointment if he has attained an age of 70 years. The confusion was whether this requirement will apply to appointments that were made prior to the Companies Act 2013 coming into force,“ said Dolphy D'Souza, partner in Indian member firm of EY Global. The case was pertaining to a listed company Ultramarine & Pigments versus Sridhar Sundararajan, an investor. Sundararajan argued that Rangaswamy Sampath who was appointed as the chairman and managing director of the company on August 1, 2012 for a period of 5 years, cannot continue as CMD upon completion of 70 years on 11November 2014. The single bench of Bombay High Court in November 2015 ruled in favour of the company. However, it was quashed by divisional bench of Bombay High Court on February 8, 2016. Companies will also need to justify the reappointment of these top officials beyond 70 years, as per the Companies Act 2013. Companies, including Auro bindo Pharma, Supreme Indu stries, Jagran Prakashan, Jy othy Laboratories, Gujarat Fluorochemicals, Vardhman Textile and Atul, among others, will soon have to pass a special resolution in this regard. 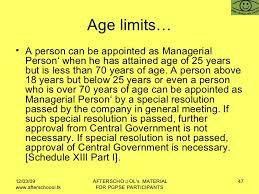 “The provision of section 196 (3)(a) of CA, 2013 applies to those who were appointed as MD or whole-time director before or after 1 April 2014. The said provision does not permit passing of a special resolution prior to expiry of the term during the term, to ensure continuation beyond 70 years.